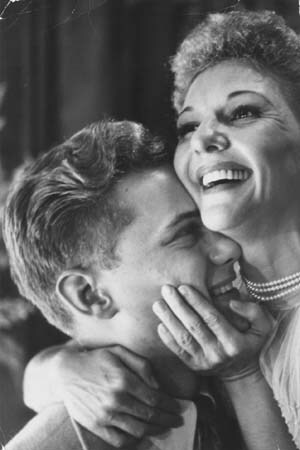 Musical theater star Mary Virginia Martin was born on December 1, 1913, in Weatherford, Texas. She was the younger daughter of Preston Martin, an attorney, and Juanita (Presley) Martin, a violin teacher. As a child, Mary performed in local theater. She started taking voice lessons at age twelve. Just before her seventeenth birthday she married Benjamin J. Hagman, an accountant in Weatherford, and soon left the Nashville finishing school she attended for only a few months. After their son, Larry, was born in Weatherford Mary opened a dance school there. In 1935, she and Benjamin were divorced. Using her maiden name, Mary Martin, she began pursuing a performing career singing on radio in Dallas and in nightclubs in Los Angeles. Her performance at one club impressed a theatrical producer, and he cast her in a play in New York. That production did not open, but she got a role in Cole Porter's Leave It To Me. In that production, she became popular on Broadway and received attention in the national media singing "My Heart Belongs to Daddy". In 1939, Paramount Pictures signed her to appear in the movie The Great Victor Herbert. Between 1939 and 1942 she starred in ten films for Paramount. She also performed on radio programs at NBC and CBS. On May 5, 1940, Mary married Richard Halliday, an editor and producer at Paramount who subsequently became her manager. They had one daughter. Returning to Broadway in 1949, Mary appeared in the Rodgers and Hammerstein hit South Pacific. Critics loved her in the comic role of 'Ensign Nellie Forbush'. She moved to London in 1951 to continue her South Pacific performance there. During the 1950's she appeared on stage and in television performances of her roles in such productions as In The Skin of our Teeth, Annie Get Your Gun and Peter Pan. In Peter Pan, Mary became the actress still most identified with the starring role. She won Tony Awards for Peter Pan and for The Sound of Music, in which she also played the lead as 'Mary Rainer'. She starred in that role from 1959 to 1961. Following a 1965-66 tour of Hello, Dolly! for military audiences in Asia, she returned to Broadway and appeared with Robert Preston in I Do, I Do. They both continued their performances in the 1968-69 North American tour. During the 1970's, Martin and husband Richard spent much of their time on their ranch in Brazil, where he died March 3, 1973. In 1978, she returned to Broadway in the comedy Do You Turn Somersaults? She hosted the 1981 public television series on aging called "Over Easy." Following her recovery from a severe automobile accident, she and Carol Channing portrayed aging actresses in the 1986 touring production Legends. Mary Martin was honored by the John F. Kennedy Center for the Performing Arts in Washington, D.C., in 1989. She died of cancer at her home in Rancho Mirage, California on November 3, 1990. Her cremated remains were buried in Weatherford, Texas.